New Delhi: Hyderabad intensifies its fight against air pollution. After launching pollution free electric autos for garbage collection and following it up with a rental electric car service, it is now the turn for city’s public transport to go electric. The city will be launching 40 electric buses in a week to connect different parts of the city to the airport. So passengers travelling to the Rajiv Gandhi International Airport in Shamshabad, which is around 29 kilometres from the city centre, will be able to cover the distance without any emissions. 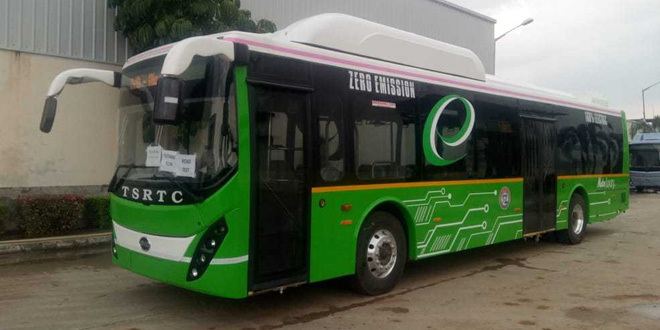 The debut of electric buses in the city will make Hyderabad first in the country to run electric buses sourced under the FAME India (Faster Adoption and Manufacture of Hybrid and Electric Vehicles) Scheme, wherein the central government is encouraging the use of electric vehicles by providing subsidies. 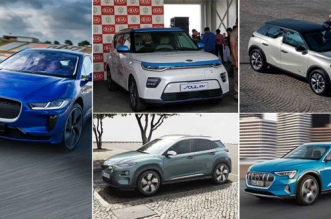 The FAME India Scheme was launched by the Ministry of Heavy Industries and Public Enterprises in 2015 to incentivise the production and promotion of eco-friendly vehicles including electric vehicles and hybrid vehicles in India. Cost of one bus is Rs. 2.50 crore out of which Rs. 1 crore is being born by the central government under FAME scheme and the remaining amount is being taken care of by Olectra. As part of the alliance, TSRTC is not buying electric buses, instead renting them for 12 years at a cost of Rs. 36 per km. After 12 years, either we will procure buses from Olectra at a nominal amount or will look for an alternative. The trial run of electric buses was conducted last year in March-April and it yielded positive results. A fleet of 100 electric buses will be introduced and in the first phase, which will kickstart in a week time, TSRTC will be giving a green signal to 40 electric buses. The 12 metre, air conditioned, low floor bus having a capacity of 39 passengers +1 (driver) seats is a zero-emission bus. Electric buses once fully charged in five hours, can run for 250 km. The electric bus battery pack has a battery management system (BMS) that monitors the safety, voltage, and temperature of the bus. As far as safety is concerned, these buses have active safety technologies, including collision avoidance and automatic emergency braking, and LED fog lights. They have the ability to avoid skidding while braking and are equipped with interior lighting and cameras. Along with providing onboard maps and navigation, WiFi and radio facility, Olectra boasts of having three phase chargers with fast charging technology, and front and rear air suspension for a comfortable ride. Having kneeling facility, these electric buses are specially-abled and senior citizens friendly. Though, it is a low floor bus, which means there are no steps, the kneeling mechanism further brings down the height of the bus, making it easy for commuters to board and get down from the bus. Also, fares will range between Rs. 150-250 per head, says Mr Ravindar.